Idaho Education News’ multimedia specialist Andrew Reed has accepted a position with EdSource in Oakland, Calif. He will work with EdNews through the first part of January and begin his new position in February. EdSource is a nonprofit journalism organization that covers education issues in California. Reed joined Idaho Ed News in February 2015 and during his four years in Idaho he helped grow website traffic and social media engagement. He improved the look of EdNews with his photos and videos. Reed also became an award-winning journalist. He was named the 2018 Idaho Press Club Videographer of the Year and he won a regional Edward R. Murrow Award for best social media. 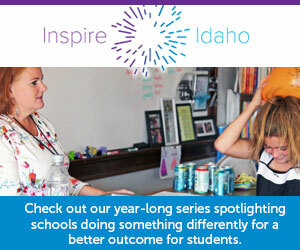 Reed has visited more than 100 schools in Idaho reporting on the best practices in teaching and learning. He shined a light on some of Idaho’s most talented educators, trustees and students. Reed said he has fond memories of his time in Idaho. His favorite assignment was shadowing 6-year-old Tripp Grenke on the first day of school. “My favorite part of the job was learning about the great things that are happening inside and outside the classroom and sharing it with the readers,” Reed said. Reed is a Southern California native and started his career in television news as a reporter in Twin Falls. EdNews will immediately begin looking to fill the open position. Click here for the job description.